Find answers to all your frequently asked questions. Settlement is a dynamic, multi-faceted, ongoing process of people’s transition moving to a new country. It is a two-way process for both the settlers and their new communities. Settling in a new country can be a stressful process. Settlement services are a range of services aimed at supporting people of refugee backgrounds and newly arrived migrants. 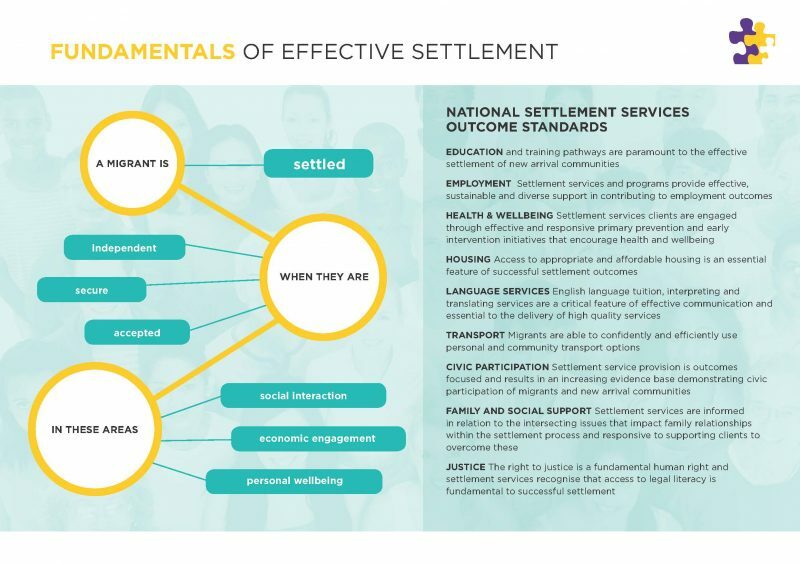 The Australian Government offers a range of settlement services to support this process and ensure positive settlement outcomes for people of refugee and migrant backgrounds. To find out more about the types of settlement services are offered see SCOA’s Settlement Services Fact Sheet. How do Australia’s settlement services compare with the rest of the world? Australia is one of the 28 countries in the world that offer resettlement programmes and consistently appears among the top three resettlement countries in the world. States like Australia that offer settlement services to assist with resettlement provide legal and physical protection, including access to civil, political, economic, social and cultural rights to refugees and migrants that are similar to these services provided to their citizens. Settlement services provided by Australia are world class and include a range of support programs and services that very few other countries provide. Whilst there is always room for improvement, Australians can be proud of the support we provide to help assist newly arrived people from refugee and migrant backgrounds to settle in Australia. Asylum seekers or refugees and migrants have very different experiences and reasons for moving to another country. Migrants choose to leave their home country, and can choose where to go and when they might return to their home country. Australia has a long history of accepting migrants. Asylum seekers and refugees, on the other hand, flee their country for their own safety and cannot return unless the situation that forced them to leave improves. Under international law, a person becomes a refugee at the time the person fits the definition of refugee. The term ‘asylum seeker’ is used to describe people who has fled their own country and applied for protection as a refugee, but whose claims have not yet been recognised by a government. While asylum seekers and refugees are in Australian territory (or otherwise engage Australia's jurisdiction), the Australian Government has obligations under various international treaties to ensure that their human rights are respected and protected. These treaties include the International Covenant on Civil and Political Rights (ICCPR), the International Covenant on Economic, Social and Cultural Rights (ICESCR), the Convention against Torture and Other Cruel, Inhuman or Degrading Treatment or Punishment (CAT) and the Convention on the Rights of the Child (CRC). These rights include the right not to be arbitrarily detained. Under the Australian Department of Immigration and Border Protection’s (DIBP) Humanitarian Programme, Australia accepts a certain number of people every year who are refugees or have special humanitarian needs. The Humanitarian Programme intake numbers are set each year. These numbers are influenced by UNHCR assessment of resettlement needs overseas, the views of organisations within Australia conveyed during community consultations and Australia’s capacity to assist. In addition, asylum seekers who arrived in Australia without a valid visa (prior to offshore detention policies being implemented) but are not transferred to Nauru or Manus Island may be granted Temporary Protection Visas or Safe Haven Enterprise visas. In 2015–16, the Humanitarian Programme was set at 13,750 places. A total of 13,765 visas were granted under the annual Humanitarian Programme, of which 11,762 visas were granted under the offshore component and 2003 visas were granted under the onshore component. In 2015–16, a total of 77,026 people lodged applications under the offshore programme component compared with 62,946 in 2014–15. Who are the SCoA National Executive? The SCOA National Executive Committee consists of two members from Victoria and NSW, and one from each of the other states and territories. Each state and territory elects its own representative(s), and the office bearers are chosen by the National Executive Committee. National Executive Committee members serve a two (2) year term. There are five office bearer positions – Chair, Vice Chair, Treasurer and Secretary. The people who make up the Executive Committee are nominated and voted for by SCOA’s full member organisations bi-annually at the Annual General Meeting. To find out more about the National Executive Committee Members, click here. Why become a member of SCoA? Make contributions to our regular e-newsletter highlighting the work of settlement providers across Australia. Click for more information on Member Benefits. Who can be a member of SCOA? SCoA is the peak body representing over 97 of Australia’s leading settlement service providers. Our members include agencies, big and small, who are committed to the successful settlement of humanitarian migrants across the country. Their services range from greeting new arrivals at the airport, through to assisting them to secure housing, access services and find their first jobs. SCOA’s aim is to provide leadership for the sector and represent a unified voice for the many and varied organisations providing settlement services across the country. We take this task seriously, and attempt to ensure that in all of our dealings with government and other stakeholders, our members’ interests are promoted as being of paramount importance. There are two types of SCOA membership: Full and Associate. Full membership is open to all organisations play a key role in delivering settlement services. Associate membership is open to other relevant organisations that share the objectives of SCOA. Full membership of entitles the organisation to vote at SCOA General Meetings and to nominate a representative of the organisation for membership of the SCOA National Executive. Being an Associate Member entitles organisations to many of the benefits of Full Members, but Associate Members cannot vote at General Meetings or nominate a representative for membership of the National Executive. To apply to become a member, please complete an application form. For more details about membership, click here to go to the membership page.